It should be clear from our discussion of transcribing speech sounds that English orthography is not a satisfactory system. What is required is a scheme that has a direct, one-to-one correspondence between an actual speech sound and the symbol used to represent that sound. 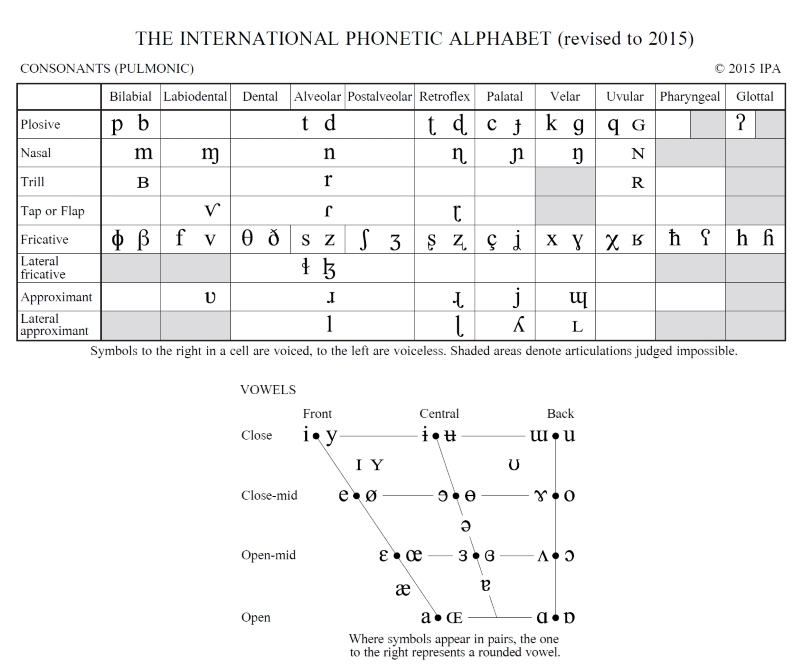 One such system is the International Phonetic Alphabet proposed by the International Phonetic Association. With this system, each symbol directly represents one, and only one, speech sound. Before we provide examples of IPA in operation, we need to make a distinction between phones and phonemes. The sounds that people produce when they speak are called phones. To demonstrate what is meant by this, consider the word top. How is the sound /t/ articulated in this word? Is it the same as in the word stop? Try it for yourself. Say both words out loud and see if you can detect any differences between the two. You may need to say the words several times in succession, and quite forcefully, in order to notice any potential difference. If you are uncertain as to whether or not there is a difference, hold a flimsy piece of paper so that it hangs down closely in front of your mouth and then say the words again. What happens now? This time when you say the word top you should see the paper blow quickly away from your lips as the /t/ is articulated. However, when you say stop there should be little or no movement of the paper when the /t/ is produced. What this demonstrates is that the sound /t/ is, in fact, articulated differently in both words. In the word top the /t/ is accompanied by a short puff of air and the sound is said to be aspirated. The /t/ in stop, however, is not aspirated. We conclude, therefore, that these articulations are two separate phones. However, the distinction between these two phones is not relevant for distinguishing between words. For example, if you substituted unaspirated-t for aspirated-t in the word top, this would result in an unusual pronunciation but it would not create a new word: despite the variant pronunciation the meaning would still be the meaning of the word stop. Aspirated-t and unaspirated-t are not perceived to be distinct sounds that are capable of creating distinctions in meaning between one word and another. In contrast, if we substituted the sound /m/ for the /t/ in the word top, this would create a new word with a new meaning, i.e. mop. The sound /m/ contrasts with the sound /t/ to create a new distinction in meaning. Similarly, we could substitute the sound /h/ in the word top and create the new word hop. Here, the sound /h/ contrasts with the sound /t/ to create another distinction in meaning. Sounds that demonstrate this contrastive function and which are capable of creating distinctions in meaning between one word and another are known as phonemes. Thus, /t/, /m/ and /h/ are all phonemes because they can be contrasted with one another to create new words with new meanings. In summary, several phones can belong to one phoneme. For example, aspirated-t and unaspirated-t belong to the phoneme /t/. The variant phones (known as allophones) do not contrast with one another to create distinctions in meaning: they are simply variant ways of articulating the sound depending on the context in which the sound occurs. However, /t/ itself – whether articulated with or without aspiration – is capable of contrasting with other sounds and, thereby, creating distinctions in meaning. Consequently, /t/ is a phoneme. In sum, an allophone is a phonetic variation of a phoneme. Understanding this difference between phones and phonemes opens the possibility of transcribing speech sounds with different degrees of detail. If we choose to transcribe all the fineness of detail that distinguishes one articulation of a phone from another (e.g. such as representing aspiration) then we would conduct a so-called narrow transcription (also known as a phonetic transcription). For example, using IPA, if we wished to represent aspirated-t, as in the word top, this would be transcribed as [tʰ]. The superscript, lowercase letter h is used to represent aspiration and it is an example of a diacritic. Diacritics are the various marks added to IPA symbols to represent different phonetic features. The unaspirated-t, as in the word stop, requires no diacritic and it is transcribed as [t]. Conventionally, phonetic transcriptions are displayed in square brackets [ ]. If, however, we wished only to represent those speech sounds that make a distinction in meaning between words, i.e. phonemes, then we would conduct a so-called broad transcription (or phonemic transcription). Returning to our opening example of how to pronounce the word row in the text Dan and Kathryn had a row in the park, we could solve the dilemma by transcribing the word phonemically. If the word carries the meaning ‘to propel a boat with oars’, this would be written in IPA as /rəʊ/, in which the vowel is represented as /əʊ/. In contrast, if we wished to transcribe the word with the meaning ‘a noisy quarrel’, this would be written as /raʊ/, with the different vowel /aʊ/. We see, therefore, that these two vowels are also phonemes because they exhibit a contrastive function that creates different meanings in words. Note that, conventionally, phonemic transcription is displayed within slanting lines //. The use of the IPA notational system removes any ambiguity. It is now clear which speech sound (in this case, phoneme) is being represented. This is achievable because of the one-to-one correspondence between a speech sound and the symbol used to represent that sound. To complete our examples, reconsider the sound ‘sh’ (as in the word fish) that we demonstrated appears in the words ocean, anxious, condition, fission, fuchsia and fashion (see Transcribing Speech Sounds). If we were conducting a broad transcription of this sound it would be represented in IPA as /ʃ/. Irrespective of which alphabet letters may be used to represent this sound in writing (e.g. c, x, t, ss, chs or sh), in phonemic transcription it is only ever written using the one symbol /ʃ/. Again, this is possible because of the direct one-to-one correspondence between a speech sound and the notational symbol used to represent that sound when transcribed. 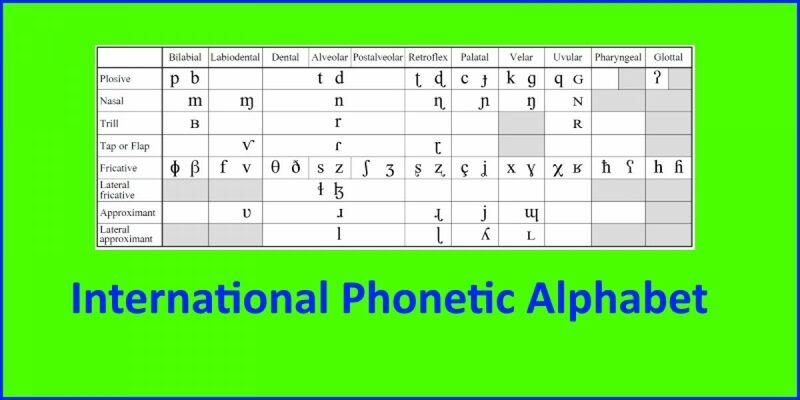 The International Phonetic Alphabet is used widely in the field of linguistics and we will be using it throughout this series of articles (English Speech Sounds 101) as the preferred notational system for representing speech sounds. The complete set of IPA symbols for pulmonic consonants (i.e. consonants made on outgoing air from the lungs) and for all vowels is set out in Figure 3. Figure 3. IPA chart of pulmonic consonants and vowels. Note, however, that English only uses a subset of the symbols in Figure 3, i.e. symbols for the 24 English pulmonic consonants and symbols to represent the 20 or so vowels used in English. We will highlight the IPA symbol for each of the English speech sounds as we take up our discussion of vowels and consonants. We begin our account in the next section with an explanation of vowels. Figure 3 is adapted from: IPA Chart, http://www.internationalphoneticassociation.org/content/ipa-chart, available under a Creative Commons Attribution-Sharealike 3.0 Unported License. Copyright © 2015 International Phonetic Association.